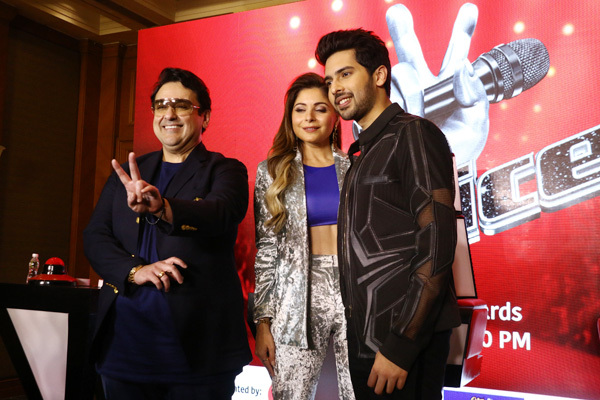 MUMBAI: Singers Armaan Malik, Adnan Sami and Kani Kapoor are coming together for the first time for the music reality show, The Voice 3, which will start airing on StarPlus from 3 February 2019 at 8pm. At the recently held press interaction, the trio spoke about what they are looking forward to from the show, which will also mark Indian music maestro A.R. Rahman’s debut as a judge aka ‘Super-Coach’ in the world of music reality shows. Singer Harshdeep Kaur will also be seen on the ‘Coach’ panel apart from Armaan, Adnan and Kanika. Armaan Malik, who is debuting as a judge (Coach) on a music reality show, is quite excited to be the youngest judge ever on an Indian music reality show. His connect with youth is something he is looking forward to, while motivating the contestants on the show. Meanwhile, Adnan Sami, who had been away from the music scene for quite some time now, is all set to bring some energy to the show with his music expertise and sense of humour. The singer cited personal reasons for his short sabbital from the world of music. Well, with so many talented singers under one roof, The Voice 3 will be worth the watch. MUMBAI: It was earlier reported that music maestro A.R.Rahman has collaborated with the makers of The Avengers: Endgame for composing the Indian version of the anthem. Now, it is learnt that lyricist Nirmika Singh has penned lyrics for the anthem titled, Roke Na Rukenge. MUMBAI: After tasting success in the form his latest songs’ Kyun Rabba and Tum Na Aaye for the Bollywood film, Badla, Amaal Mallik has now recorded a 24 piece orchestra for one of the songs Chale Aana for the upcoming movie, De De Pyaar De.